Matilda Goad is a London based Creative Consultant who focuses on producing interesting and stimulating visual spaces. With an eye for detail and quest for the unusual, combined with a wealth of experience in various creative industries she delivers her unique aesthetic to events, interiors, restaurants, stores and windows. We spoke to her at home wearing two new pieces from our Autumn Winter collection. Tell us about your journey from leaving school to where you are now? I worked in the fashion industry straight out of school first as a stylist and then for Venetia Scott (stylist, image maker and photographer now turned Fashion Director at British Vogue) for about seven years before I took a gradual side step to a creative world that growing up I didn't really know existed. And still defiantly is not a on career that is in drop down boxes on legal forms! The last few years I have taken on so may different creative jobs from working with flowers to designing shop windows to sourcing furniture for clients. It is so fun as each day is very different and each areas inspires the other. You have created visual spaces, dressed windows and have recently launched an online store selling wonderful lampshades, jugs etc. How did this come about and why? I really enjoyed the process of pitching an idea to a client and then making it happen - sourcing the man with the skills who can make your sketches come to life! It was a gradual process starting with a lampshade design I was determined to make exist and now includes ceramics, glassware and candles to name a few. I'm a big believer in surrounding yourself in pieces that make you feel good and I love the idea that my products can bring a room to life without having to spend tons of money. Which is your favourite piece from your store? I am really excited about the new denim scallop lampshades - it is a typically unusual material to use but surprisingly it looks super chic and works in every style of room! Where are your favourite places to source unusual objects and generally go browsing? I am huge antique fan - everything I wear and have in my home is old!! Even my wedding dress was!! Which designers are you lusting after at the moment? Interior based I love what Beata Heuman is creating at the moment, she’s so brave yet they seem so effortless. You have recently moved flat and redecorated. Tell us what you did and what you chose. Colour is super important for me - so there was a lot of time send trialling paints! I'm really into print at the moment and wallpapered a few rooms which has totally transformed the space - we are now desperately on the hunt for furniture! What is your wardrobe staple/ fail safe? Which piece from the new AW Blake season is your go to? What do you love about knitwear? Its almost your armour come winter and a good piece of knitwear that feel good to the skin makes you feel great! Matilda's first Pop Up store is from: 7th November - 12th November. 121 Sydney Street, London, SW3 where she will be selling all her beautiful pieces alongside some other great designers. Make sure you pop down! Photos by Thea Lovstad. Words by Alice Byrom. 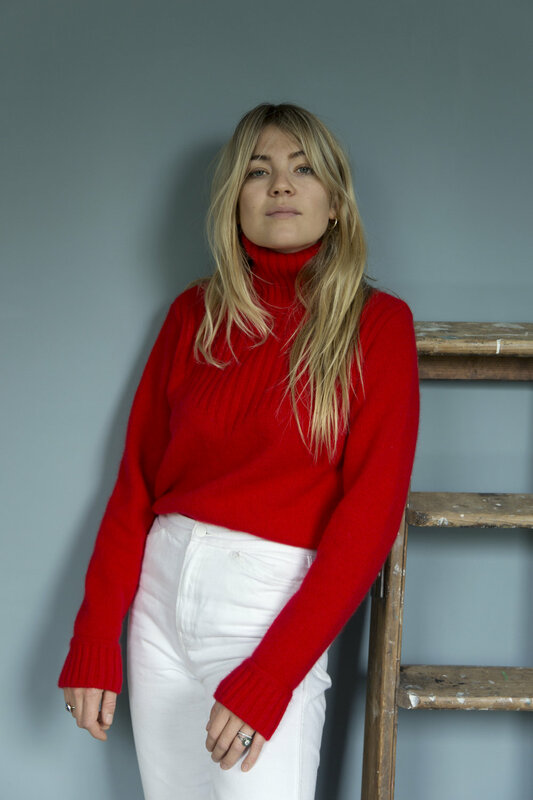 We shot Matilda at home, wearing the PHILIPPA sweater in camel and the REDFERN in red.